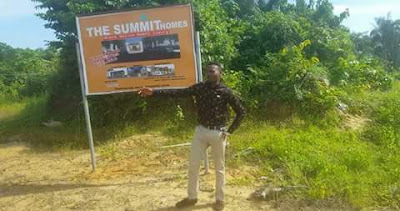 The Summit home is an awesome and affordable estate located in a peaceful environment in Ibeju Lekki, Lagos State. 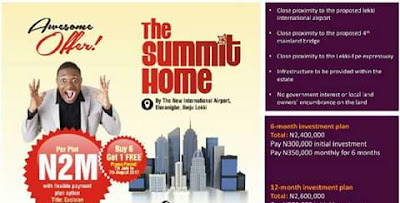 A plot in that axis has been projected to sell for over (N10,000,000.00) Ten Million Naira in 4 years time. Take that bold decision today and smile for your Return on Investment (ROI) tomorrow. Location: Eleranigbe along International Airport, Ibeju, Lekki, Lagos. Price: (N2,000,000.00) Two Million Naira Only. Promo: But 6 get 1 free.